Recently I had the privilege and pleasure of spending some time at the Margaret Herrick Library in Beverly Hills, California. This was my second time there; in 2012 I did some key research at the Herrick for my Buster Keaton-inspired novel, LIKE ANY OTHER MONDAY. The library is the main repository for research materials of the Academy of Motion Picture Arts and Science, and within its shelves and vaults there lies a treasure trove of original materials – not only rare and not-so-rare books but also documents, photographs, scripts, date books and much more, much of it dating back more than 100 years, when the film industry was in its infancy. In 2012 I spent three heady days in the Katherine Hepburn Reading Room at the Herrick, fostering a strange and recently developed obsession with the silent film comedian Buster Keaton. Seven hours each day I spent reading carefully through scripts and documents and datebooks, and looking at 100-year-old photographs in an effort to better understand what made Buster tick, how it was that a vaudevillian child prodigy comedian became one of the greatest filmmakers of the silent era. I’ll never forget the sense of awe that flooded me as the librarians handed me one artefact after another, possessions and documents that once belonged to Buster Keaton the 6-year-old, the 11-year-old, the 20-year-old, and beyond (please enter here for more from that earlier visit). Not long after that visit, I wrote the first draft of my novel, a fictional portrait of the final months of Buster Keaton’s time on the vaudeville stage. Which brings me to last week, my second time visiting the Herrick. 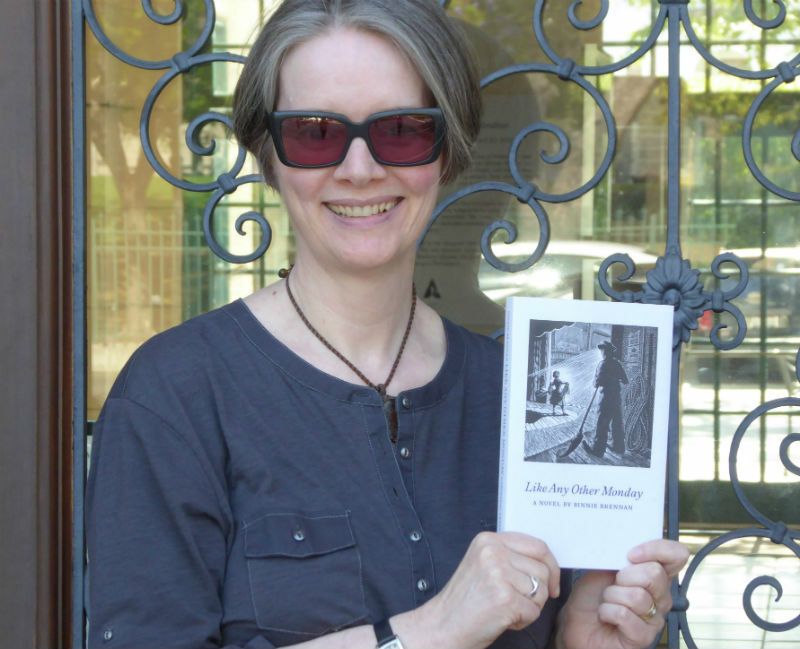 A few minutes after the above photo was taken (yours truly standing outside the library), I handed over my copy of the book… to be placed on the library’s Keaton shelves. It’s impossible to convey what a thrill it is to know that LIKE ANY OTHER MONDAY will be available among other research materials at the Herrick. I’m not sure I ever did find the answer to the question of what made Buster tick, but I gained certain insights to his creative thinking and did my best to put them across in my novel. That this little obsession of mine brought about a little book that now has a place on the shelves of the very library where the inspiration to write that book took hold… well, it’s a lot more than I could ever have dreamed of happening. Tags: Buster Keaton, Like Any Other Monday, Margaret Herrick Library, Silent Film Comedy, Silent Movies, and Vaudeville.